An original Bill Ward artwork from Fetish Times. 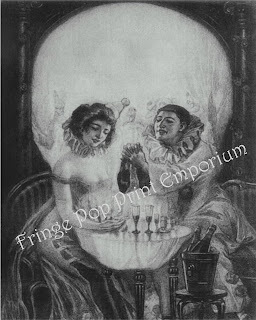 Art Prints from Fringe Pop Print Emporium - Steampunk Oddities Mermaids Pin Ups Flappers and More! 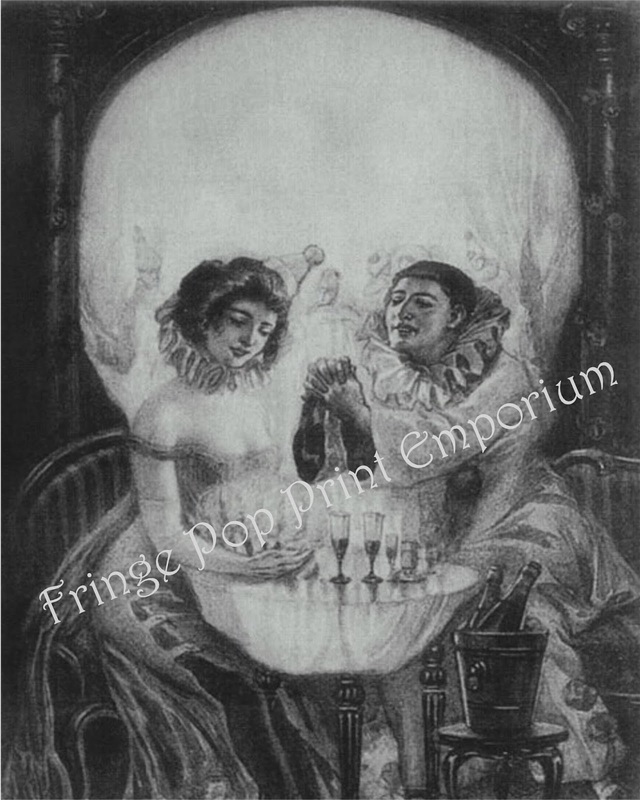 I've created an Etsy art print store to reflect my love for the weird and esoteric things in my collection. My work is inspired by items in my collection but also the Victorian era, steampunk, pin up art, mermaids, whimsical animals (octopuses, squirrels, owls, and more! 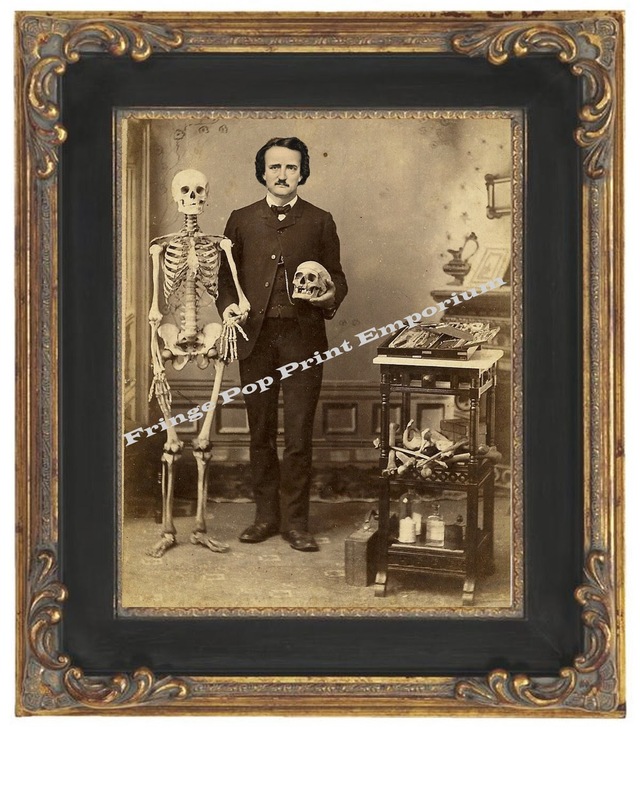 ), Abraham Lincoln, Edgar Allan Poe, horror, zombies, and more! I hope you enjoy. 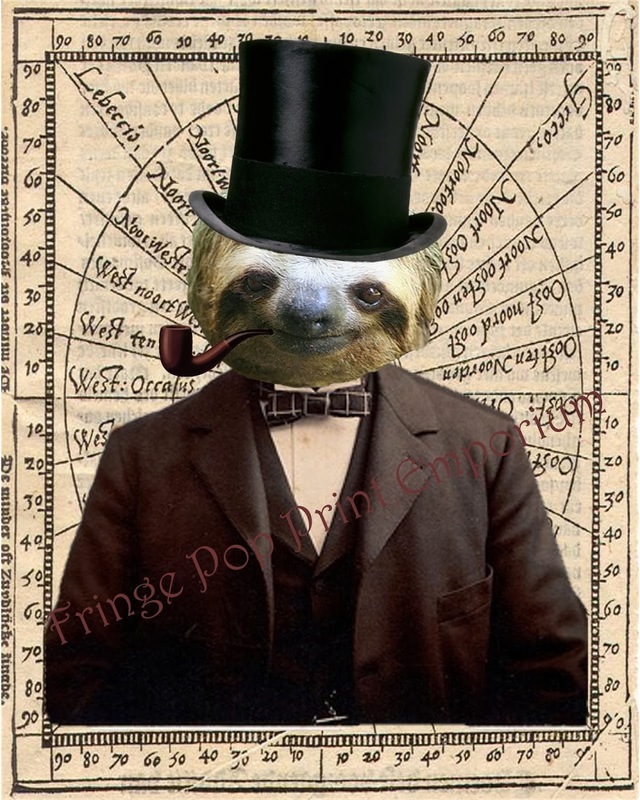 Here are some sample creations and here is a link to my store Fringe Pop Print Emporium. 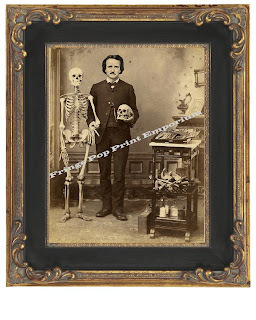 Fans of my blog might be interested in my Victorian Oddity Prints section the most. Thanks for checking out my art print shop! It's been a labor of love, and I'm happy to share these images with the world. I don't normally use my blog to advertise items that I am selling, but we are parting with a truly rare gem from our highspot first edition collection..."Alice's Adventures in Wonderland" by Lewis Carroll. You'll find the item listed on eBay here (and the description is below for your consideration): Alice's Adventures in Wonderland. It kills me to have to part with this rare piece of literature so I hope a collector out there will give it a new home and appreciate it as much as we have appreciated it. Offered for sale is: Alice in Wonderland (Alice's Adventures in Wonderland) by Lewis Carroll. Boston: Lee and Shepard, 1869. Hard Cover. Original publisher's decorated cloth. No restoration of any kind has been done with this book. Authentic and genuine in every way. Previous owner's contemporary penciled name and date of 1869 on first free end paper blank page; Book Condition: Solid Very Good Condition. Light rubbing and minor wear to extremities, fore-edges and corners lightly bumped. See pictures for condition. FIRST EDITION and FIRST PRINTING of the first American edition. Illustrated by John Tenniel. Original publisher's red cloth. This is a highspot of children's literature and a beloved book for many which has been made into numerous films and whose influence has traversed popular culture with everything from psychedelic drug use to influencing costume design. "Lewis Carroll” was the nom-de-plume of Charles Lutwidge Dodgson (1832–1898), author, mathematician, and photographer, best known to book collectors (and children everywhere) as the author of Alice’s Adventures in Wonderland (1865-first published in the UK), perhaps the best known children’s book in the language and certainly one of the most influential. After Alice, no children’s book could afford to be stuffy, didactic, or entirely free of fantasy again. The publication history of Alice’s Adventures in Wonderland is a story in itself. Dodgson had an unusual degree of control over his books, his publishers Macmillan simply arranging for printing and distribution of his books in exchange for a small commission. Therefore when the first printing of Alice dissatisfied him, Dodgson felt free to have the whole edition recalled. A similar fate later met an inferior edition of The Game of Logic (1886); the entire first run of 10,000 copies of The Nursery ‘Alice’ (1889); and the sixtieth thousand of Looking-Glass (1893). Only two dozen or so copies of the legendary “1865 1st UK edition Alice” are now known to survive (which is the 1st UK edition-all of which are in museums and in the wealthiest collector's hands and now impossible to obtain), but the unused sheets were sent off to the United States for use by Appleton’s for the American edition of the following year in 1866. These were under 2,000 of these "unused sheets" used for American published edition and that edition is almost impossible to find for sale anywhere and will command exorbant prices when one comes up for sale ($50K+). The 2011 Ahearn's Guide to Collected Books, 4th Edition (The book bible) had that edition as being valued at $35,000. The 1869 Lee and Shepard Publisher's edition is the first fully published American Edition-the actual first edition/printing of the book fully made in America. For sale is that edition-the fully REAL first edition/first printing of Alice in Wonderland published in America in 1869. It is fully recognized as the first American Edition. There are only 2 copies of this book for sale on ABE-both of which are more expensive (even my buy it now price is better). This will be a highlight of your book collection, a great investment in collectable literature, or a perfect gift for someone you love. The authorized London edition, though also dated 1866, was actually published in time for Christmas 1865, though post-dated to the new year in line with usual practice. Alice’s story was completed in Through the Looking Glass and What Alice Found There (1871). Readers hungry for more in a similar vein were gratified by the longest nonsense poem in the language, The Hunting of the Snark (1876). Dodgson also invented and published a variety of puzzles and games, some in verse, for what he imagined to be a world of child friends, including Doublets (1879), A Tangled Tale (1885), and The Game of Logic (1886). A pioneer of early photography, Dodgson has been called “the most outstanding photographer of children in the 19th century” (Gernsheim, 28). Alice in Wonderland is known for it's original illustrations by artistic collaborator, John Tenniel. his art is some of the most well known in the world. In this video, I present vintage office themed sleaze paperbacks from the 1960's. These evocative cover illustrations look like they could be scenes painted from the TV Show "Mad Men." I did one previously on this same topic but this video features different books.